After my Transiberian trip in Summer 2006, I was back on Baikal Lake between February 23 and March 11, 2007. I want to say a very special thank to those who helped me to prepare it. Because of them, I could plan everything, without using any travel agency avoiding « packages »; I must once again specially mention my Irkutsk friends, the unique Igor Ushakov and the precious Ekaterina Slobodchikova. Natalia Bencharova from Olkhon Island (Nikita’s homestead) helped me, via numerous emails, to improve my itinerary so that it could be feasible. Last but least, I bothered a lot Jack Sheremetov (Baikaler Hostel) who allowed me to benefit of his very complete knowledge for trips around Irkutsk. This was for the preparation, but it is not all. Igor and Ekaterina offered me opportunities to go to places where I would never have gone by my own. The way I discovered these places, with them, was also not what standard tourists can enjoy. I must add that, when I was alone, they asked me to report regularly by SMS to them saying if everything was OK and safe. It is a support that cannot be evaluated. I landed on February 24, had breakfast with Igor, Ekaterina and Masha, did some winter shopping with Igor, had a nap for jetlag and had diner with Ekaterina and Masha. I slept in Jack Sheremetov’s Baikaler hostel. On February 25, I went to Listvianka with Igor Family and had diner at their home. I slept at Baikaler hostel. On February 26, I took, at Irkutsk central station, the marshrutka for MRS and there got Nikita’s van for Olkhon. On March 2 evening, I arrived on Irkutsk Central Market with the marshrutka from Olkhon. I slept at Baikaler hostel. On March 3 morning, I left Irkutsk for Tunka valley with Igor, Nastya, Taya and Sasha, before taking the circum-Baikal train. 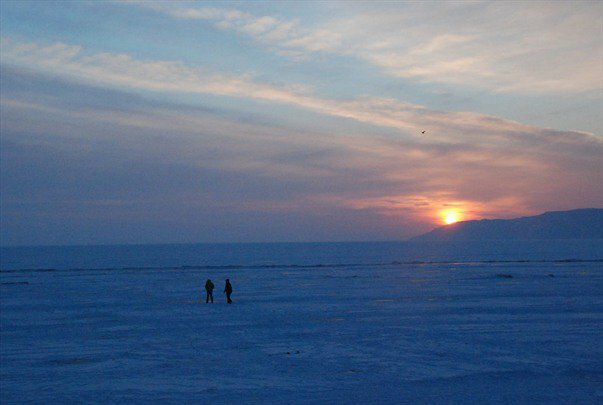 On March 6 afternoon, I arrived from circum-Baikal with Ekaterina using a hovercraft from Port Baikal to Listvianka and marshrutka from Listvianka. In the evening, I took a bus for Bolshie Goloutsnye at Irkutsk station. On March 9 afternoon, I arrived from Bolshie Koty by foot on the lake and by hitchhiking until Listvianka. Between Listvianka and Irkutsk, I took a marshrutka. In the evening, I had diner with Jürgen, from Belgium, in Snejinka café. I slept in Baikaler hostel. On March 10, I spend sometimes with friends in Irkutsk. I left on March 11 morning. On February 25, Igor, and his daughter Nastya, came to Baikaler to pick me up for a day trip. We stopped at his apartment on the opposite bank of the Angara River. His wife Natalia, Natasha, joined us. Then, we took the road of Listvianka on Baikal Lake and, after 47 km, we visited Tilts open-air museum. With the snow fall during the night, the landscape was absolutely beautiful. Then we continued to Listvianka. Because mountains surround Baikal, there are few accesses to it. Moreover, in many places, mountains go directly to lake water. Geological sedimentation created a small « platform » where Listvianka was built. There is a good 70 km highway between Irkutsk and Listvianka using partly the passage forced by Angara thru the mountains. There is no road after Listvianka. When you are in Irkutsk and want to reach Baikal, or when you want to go to Irkutsk from Baikal, you always go via Listvianka. Listvianka is the most favorite recreation place for people living in Irkutsk. This place is changing fast, probably not on the best way, due to tourism. Ugly houses and hotels grow up like mushrooms. Villages spoiled with alien buildings are loosing their character. However, the gorgeous nature, the pure lake, the beautiful view are untouched. There are very few big or average size towns, like Irkutsk, in the world having this kind of natural wonder in their vicinity. On this February 25, I shared with Igor family the traditional Sunday excursion of Irkutsk inhabitants. We finished this very busy day with a good Siberian diner at Igor and Natasha’s. Before that, I went with Igor to drop his car for the week in the collective garage area. We knew it would be much better to take a taxi than driving back from Igor’s to the hostel in the night. The diner was a good opportunity to complete my training in Russian « toast-management ». On Monday February 26, I went to Irkutsk bus station and got a marshrutka for Olkhon. We left at 9:00 AM. All the people, driver included, were Buryats.Nobody was Russian. I was the only one from European origins. During 4 hours, we had no « technical landing ». People just got in and got out in different villages. It was a bit difficult to observe the landscape, as the minibus windows were covered with ice. I noticed two things. Regardless how simple were the places we stopped by, young girls and ladies were sophistically dressed for this travel. It was pleasant to observe. It was neither the first nor the last time I noticed that people in Siberia are not dress as casual as are Westerners. I also realized that the more we drove to North, the less snow we saw. This area receives around 200 mm of water per year. It is a very dry climate. We even went thru valleys with no snow at all. The Marshrutka did not go until Kuzhir on Olkhon Island but stopped at MRS on main land at 13:00 (1:00 PM) after a 300 km trip from Irkutsk. There, I met with Sergey from Nikita’s homestead. We did together the last 40 km to Kuzhir. As soon as I arrived at Nikita’s, Olga came to me. She knew who I was, before I even introduced myself. She showed me my room and immediately gave me a lunch. I had a strong first positive impression of the place. Nikita and Natalia really know how to create a unique atmosphere. They are able to communicate their spirit to their complete team, a group of smiling, friendly, helpful and efficient young people. While I prepared my trip from France, Natalia Bencharova told me that they would have a group of tourists with whom I could attend some excursions. Actually, a group of German Greenpeace tourists (!?) was there. On my second day, they had a trip to the North of the island. Olga asked them if I could come with and share the cost. The answer was fast and sharp: « NO ». Probably they never heard that car-pooling is an ecologist way for mitigating pollution? I could not afford this trip alone. I missed the famous Northern cliffs. I staid in Kuzhir and took pictures. Thanks to Olga, Helmut and I had the opportunity to observe how people fish under the ice with a net. On February 28 morning, Viktor and Sasha came to pick us at Nikita’s with their Volga car. We drove to Maloye Kuzhir and went on Maloye More (Baikal between main land and Olkhon). This first day the net was installed under the ice. On March 1, we went back to collect the net and the fish. This fishing process is the one used to catch omul, Baikal endemic specie, the most famous and demanded one, close to salmon. Then I went back to Irkutsk. From Irkutsk, we drove 100 km, on Moscow-Vladivostok highway until Kultuk, the South West end of Baikal. From Kultuk, we turned right to head full West. Tunka valley starts 30 km West from Kultuk and goes between Tunkinskii range (Eastern Saian) und Khamar-Daban range until the Mongolian border near the lake Khövsgöl. This valley is considered the way used by Genghis Khan. It is still the way used by Irkut River from which Irkutsk city took its name. Fifty kilometers after the entrance of the valley, we took another 28 km road, full North to the bottom of high mountains. Thus, Irkutsk-Arshan distance is between 220 and 250 km. Tunka valley population is mostly Buryat. Arshan is beautiful traditional village located in a very scenic area at the bottom of high mountains. Besides regular rural activities, it is also a popular thermal resort (different mineral waters from +11°C to +45°C). According to the season, its population varies between 900 and 3 800 persons. Thanks to Sasha and Igor we could be accommodated in the Institute wooden house geared with a big wood stove and all the Siberian rural comfort… Therefore, nobody blames you if you do not wash or do not shave yourself. Visiting the little house of the garden in the night is not even an adventure, if you remember you have to dress yourself with more than just a pyjama. We arrived there around 3:30 PM. After a good lunch, we had a pleasant walk in the forest along the Kingarga River. This river is famous for its waterfalls. Actually, the waterfalls were frozen even if water was still running under the ice. Kingarga in Buryat means « drum » because of sound of the fast water. In winter, this « drum » is very soft due to ice and snow. Badary Telescope is in the West of Arshan. I am sure it is one of the most recent and high-tech equipment for astrophysics in the world. Thus, international specialists probably visited it before me. However, it is not a place for tourism. Except for some high skill specialists, I am likely the only Western traveler who had the privilege to enter it, thanks to a written recommendation that our scientists Igor and Sasha obtained from Irkutsk Institute. Badary is isolated in the middle of taiga and steppe. Igor and Sasha found the way to get there, using Google Earth. Coming from Arshan, in this clear and sunny morning, it was a wonderful country road. Badary Telescope was built in 2005. Roman Iourievitch, the Director, who took care of us and kindly spent a lot of time with our group, expressed his admiration for those who completed its construction in less than 6 months, with a temperature generally around minus 35°C… This very recent equipment is part of a net. The two other telescopes of the net are located in St Petersburg and in Caucasus. The St Petersburg’s one is the main one. The distance between each telescope is thousands of km. This is because, the biggest is the distance, the best is the resolution. Badary’s location was also chosen for the construction because of its very dry weather and its minimal (if none) level of pollution. Its sky is particularly pure. Moreover, the place is so isolated that there are no risks of interferences created by electric equipments or power-lines. Even, if around Baikal, there is an important seismic activity that could prevent the quality of the observations, Badary is on a very deep level of sand that is a key advantage for stability. Telescope’s weight is 900 tons. It is 32 meters high when horizontal. Its diameter is 32 meters too. We can then assume that, when vertical, it is around 50 meters high. Two teams of ten persons work and live in the place. Each team works ten days before shifting the service with the other one. It is involved in Astrophysics and Astrometry tasks and is able to see quasars. Quasars are situated very far from our earth, but they never move. Therefore, they are used to measure distances between galaxies. Taya made reportage about the telescope including an interview of Roman Iourievitch who was patient enough to friendly give all the explanations we asked him. Then Taya recorded my impressions to get the enthusiasm evidence of a Western person for this brilliant example of the Russian technology. The complete reportage was broadcasted, the following day, on NTS (Siberian Television) on prime time. I would have been deeply honored to show a short video of my first interview for a Russian TV on this website… Unfortunately, Taya’s Manager, who is likely as stupid as rough, prohibited Taya to give me any copy of it, regardless the fact all of this was already made public thru broadcasting. With this kind of low profile behavior from Russian media managers, we can understand one of the reasons why, from outside, we do not have the same kind of information and why our opinions might sometimes defer from the ones of our Russian friends about international events or about some country leaders. Badary Solar Station is situated a couple of kilometers in the West of the telescope. We had a long and interesting visit of the station thanks to Alexei, a young and passionate scientist working there. The installation was built beginning of the 80’s. Its location was determined according to the same reasons than the telescope ones. The purity of the atmosphere was a key advantage, though it does not work with optical means but with radiofrequencies. Station is composed of numerous antennas. Each antenna “just” has a 2 meters diameter. It is rather smaller than those used in the USA. To face the small size, the builders displayed 256 antennas. All these antennas move together, exactly on the same way, to follow the sun. Station scientists have been able to face the hard coordination challenge of so numerous equipments. There is one computer every 60 antennas. Alexei said that recent Japanese visitors expressed a strong surprise, as they did not know it was possible to reach such a sharp coordination with so many antennas. Starting from the main building basement, there are two tunnels under the antennas for maintenance and connection purposes. One tunnel is 300 meters, the other one is… 600 meters. Normal team is 20 persons working there two weeks. Then, another team comes for the next two weeks. The station reports to Irkutsk institute. However, it is important to notice that everyone in the world can view daily the pictures of the sun taken by Badary. Alexei indicated us the Internet access www.badary.iszf.irk.ru. I tried from France. It works perfectly. You can see a screen capture and video download I made from this website. It was the place where I said good-bye to Igor, Taya, Nastya and Sasha before they continued to Irkutsk. After 3 hours spent in an elektrishka, Ekaterina arrived from Irkutsk at 12:50. At 13:00 (1:00 PM) we were in the regular Circum-Baikal train for the most famous part of the historical transiberian railway. Yes, this way is very famous. But, it has no means for long distance travels as, today, the transiberian trains use another way. The old part between Port Baikal and Irkutsk is under water because of the Angara dam construction (1950 – 1958). Usually, when foreigners take circum-Baikal, they use expensive private tourist trains. Ours was the regular one. It is vital for the villages where it stops. They are connected with no roads. Apparently, people living in these villages are very poor and simple. When we entered one of the two carriages, the atmosphere was not so good. All the people, who were not drinking, looked at us on strange way. We focused attention. Ekaterina said nothing but showed an extreme tension. Our neighbors wanted me to drink and to play cards with them. I refused to drink. I always remember what Igor told me the previous summer: “Never drink with people you don’t know ». I said to « our friends » I do not know how to play cards, which is true. Ekaterina did not talk in English. She wrote on my paper notebook: » They want to play cards with you and steal money and everything and they will leave in Port Baikal as we. I am afraid. They are local inhabitants ». That was what they were talking about together. They said to Ekaterina she was not allowed to translate their plan to me. In writing, we decided to go to the other carriage. All my belongings were in the locker under the bench on which these men were sitting… Finally, we jumped out, in Kultuk, with our bags and rushed in the first carriage. We took the two places nearest to the Provodnitsa. Unfortunately, these places were facing the mountain and not the lake. Ekaterina consider it was not safe to move. She did not want to meet the men again. Meanwhile we tried to find an accommodation, in Port Baikal the terminus, by cell phone using my travel guides. Nothing worked. I was deeply sorry that I involved Ekaterina in such a messy and risky trip. Finally, she asked the Provodnitsa who said: “don’t worry; you will sleep in the train station. It is good and safe”. We could not believe it. However, what else to do? We had to trust her. In our carriage, were almost only ladies. The ones who did not drink were with kids and smiling to us. After numerous hours, we started to feel better. We could start to look at the landscape. Before the night, I could use a little bit my camera, considering it will not create dangerous temptations for people around us. That was the end of the only period I did not feel safe in Siberia. A feeling I never had until now in this part of Russia. From Slyudyandka to Port Baikal, Circum-Baikal railway is roughly 120 km. The average speed is around 20 km/hour. Normally, travelers have plenty of time to look at the landscape, subject to the fact they have no other concerns. It was a bit different for us. As mentioned above, the Circum-Baikal trip was not the best one. I was sorry for Ekaterina but also very grateful for all what I avoided thanks to her vigilance. She finally smiled at Shumika when I sat on the legs of a lady who was sleeping under the blanket. I was confused but the lady reacted very friendly. In the dark, the train stopped at Port Baikal station, a beautiful renovated (or rebuilt) wooden building. In front of the door, a black dog came to us to say hello. We entered the place. It was clean and safe. The security guard came to welcome us. The young lady in charge of the hotel indicated where to leave our shoes and to take slippers. It looked peaceful, warm and safe out. The Provodnitsa was right. Everything was true! The young lady showed us a big room with many beds. We were the only clients. She indicated us the kitchen we could use, as we want. Of course, they were no restaurants in the village, just a small country store. Going there, we had not to be afraid to meet our « train friends ». The dog walked next to us and did not allow anybody or any animal to approach us… He waited for us in front of the store and came back to the hotel with us. He did not try to enter. In the morning, we had a pleasant walk in Port Baikal under the close watch of our dog who was waiting for us in front of the door, probably the complete night. With the help of the hotel security guard, we arranged a transfer at 11:00 AM with a hovercraft until Listvianka. At 12:10 (noon) we got a marshrutka from Listvianka to Irkutsk where we arrived at 13:30 (1:30 PM). On March 6 afternoon, I arrived back in Irkutsk with Ekaterina, from Port Baikal via Listvianka. After a few hours, I went to central bus station, Avtavogsal. I took a bus, at 17:00 (5:00 PM) for the 120 km to Bolshoye Goloutsnye. The road went thru mountains and taiga. I travelled with Viktor, a former Ranger, working, as far as I understand for Ustye, a NGO for local development. He found a homestay for me at Gala’s. We arrived in front of her house at 19:35. During the travel, Viktor gave me some specific information. Bolshoye Goloutsnye main activity was forestry. At this time they were almost 2 000 inhabitants in the village having good jobs. For example, Gala’s husband got a 1000 rubles monthly salary from forestry, while the « regular » salary was 120 rubles (long time before 1998 National currency crash). During Perestroika, it was decided to create a protection around Baikal, including erosion prevention. Pribaikalsky National Park was created on Western shore, including mountainsides facing Baikal. As a consequence, cutting trees in these places became completely forbidden. Bolshoye Goloutsnye went down to 600 people (lost 1 400 inhabitants, i.e. 70 % of its population) in a short a period. Forestry shifted to the other side of the mountain on the upper Goloutsnya River, to Maloye (small) Goloutsnye whose population is now larger than Bolshoye (big) Goloutsnye… Gala’s husband became a Ranger but he is mostly a fisherman. He and his wife have two daughters. They are lawyers in Irkutsk. Viktor added that Pribailsky National Park on the Western side of Baikal is very hard to manage There are only two rangers. The Park is very long but also very narrow (only 3 km in some place). It is crossed by numerous roads that cannot be controlled. In opposite Barguzin Reserve on the other side of Baikal has a much more convenient and efficient shape. On March 7, I « visited » Bolshoye Goloutsnye. I do not know if it was because of the weather but my global impression of this village was very depressive. I expected something more authentic than Listvianka, a place with character like Bakailskoye on the Northern side of Baikal (where I went on Summer 2006). I expected a lot, coming to such an ancient and historical settlement. It is true. It does not look like Listvianka at all. However, it was not a charming view too. Actually, B Goloutsnye appeared like two long « streets » with almost nobody. I could not avoid a strong feeling of sadness and boring decline. Viktor told me that most of the fishermen were far away on the lake. It could explain the lack of life. Why not? May be in spring or in summer the place looks better with some green steppe, may be. However, I must mention that Gala’s accomodation was perfect. Her warm house is very well maintained. She is friendly, good cook and speaks a few English words. In her backyard, I have seen new well-designed wooden bungalows. I am sure it is the right place to stay for summer. Viktor found the right homestay. I do recommend Gala’s hospitality. I wanted to see Bolshoye Koty while I missed it last summer. So, I considered there is certainly some traffic on the ice between B Goloutsnye and B Koty. 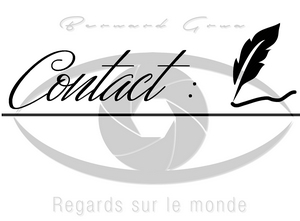 The contacts initiated from France with Viktor made me understand I was completely wrong. There are some « warm » currents. Ice is too weak for cars. But he said that it could be possible with a motorcycle. When I prepared my trip from France the major question was: will the ice be strong enough to go to Listvianka from Bolshie Koty. One week before Igor asked one of marshrutka drivers if any of them go to Koty. He said no. It is too dangerous. He added that on a previous day, one jeep went to water thru the ice and one man was dead. However, Anton, a guide I met in Olkhon, told me he could recently drove a car there with no problem. I decided to visit Bolshie Koty. What were the reasons for that? Compared to Bolshoye Goloutsnye, to Bakailskoye, to numerous other places around Baikal, Bolshie Koty is a very recent village. It was created at the end of 19th century for gold mining. I did not expect to see many things there. Lonely Planet guide says you just need to spend two hours in this village (between arrival and departure of your boat). I just went to this place because I wanted to see how people leave in winter in a small village connected with no road. Lonely Planet was wrong. Bolshie Koty deserves much more than a quick look. Of course, there are some dachas. Of course it is, in summer, a « recreation resort ». Of course you have some « New Russian » houses. But this is an actual live full and peaceful village. You see people. They know each other. There is a family safe and friendly atmosphere. The location is scenic, surrounded on three sides by mountains with an open side on the lake. “There are 25 houses with 37 permanent residents in winter. In summer, the population reaches 500 persons for a total of 35 to 45 houses. People activity is fishing, selling food, farming and providing homestay. Cows, milk, butter and cream are 50% for local use and 50 for tourists. Annie knows personally seven families living from fisheries and three families living from selling milk. There are seven stores in summer. There is a biological station, a meteo station, a museum and a sanatorium for people of gold mining company (though there is no more gold mining in Koty). Until the 70’s, there was an animal farm (conservatory). There was a hospital that was closed 7 years ago. There is a junior school (children from 6 to 11 years old). Older children go to school at Listvianka or Port Baikal. There are six pupils in school. The same teacher takes care of all of them. According to our previous agreement, Viktor was supposed to be my guide for March 8 complete day. He was also supposed to help me finding transportation to Listvianka for the following day. Actually, he dropped me at Anna Nikolaevna’s and immediately returned to Bolshoye Goloutsnye. For sure, he is not a bad person, but I do not know if he really decided what he is or what will be his job. I will not blame him for charging me a full day as he did, because I am sure he has a life harder and with less hope than mine. A short time after Viktor and Pasha left, the weather that was so bad for our motorbike trip became fine. I decided to walk to enjoy the place. I was impressed by what I saw. At tea, Annie arrived and explained me more. After diner, I went with Annie to Anna Nikolaevna’s daughter, Nina, to bring her family some cakes she cooked. It was March 8, women’s day (a very important day in Russia). In a warm atmosphere, we shared cakes, zakuski, toasts and vodka with her, with some of her friend and with her husband, captain on a Baikal boat. A lady, one of their friends, speaking a good English, asked me numerous questions about France and about my life. She also translated other people questions and my answers. I was impressed by the knowledge of French history, culture and literature all of them had. Unfortunately, it was such an intense multi-interview that I did not have time to think about any information I could ask. I missed a good opportunity to learn a lot from these nice persons. However, Nina agreed to open, for me, Bolshie Koty library that she is in charge of. We scheduled an appointment there for the next morning. Annie would come as the translator. Anna Nikolaevna’s daughter, Nina, was kind enough to open the library for me on March 9 morning as agreed the previous evening when I was at her home. Annie joined us to be our intrepretator. Together we had a look on books, on the guest book with some well-known international signatures. I could also see pictures albums, started almost at Koty settlement beginnings. Nina is a Biologist graduated from Irkutsk University. She is an ‘algolog’, specialist of endemic macro algues that grow around 100 m depth in Baikal. Though, there is a biological station in Koty, no researches are made, as there is no funding is spite there is so much to do in Baikal due to its outstanding nature and its incredible number of endemic species. Nina is also graduated for library management from Ulan Ude University. Nina asked me what were the Russian authors I knew and what I was thinking of them. I had to talk about Tolstoy, Dostoevsky, Pushkin, Gogol, Soljenistin, Pasternak, Valentin Rasputin. I don’t know if I mentioned that I studied « State and Revolution » from Vladimir Illitch Oulianov… I said that I read one book of Andrei Babitski. I added that I got all Ana Politkovskaya books translated in French. I read them numerous times. Then, we came to Bulgakov that I discovered thanks to Ksenia. I said that I had no problem reading Molière’s life, the White Guard and the letter to Stalin written by him but that, in spite of my best efforts, I could not go thru « Master and Marguerite ». I understood that my culture of Russia and Soviet period was not complete enough to allow me getting all Bulgakov’s substance. Nina who read it more than ten times… consider it has one of the masterpiece of Russian literature achievement. I left Anna Nikolaevna’ house around 1:00 PM. I wanted to be on my 18 km way earlier. But Annie strongly recommended me to wait. Morning was too cold. She came with me to village last houses and I was alone against wind and flying snow. However, I had too many clothes. I went into a cave with ice stalactites to take off one sweater from under my jacket and my rucksack. Due to the freezing wind, it might have been dangerous doing it outside. I walked not more than 6 kilometers seeing cars, and even a truck full of wood, going to Koty. The first car going in my direction stopped. It was a grey Volga that I saw the previous day in Koty. The driver, one of the two men, was Valera (?). The ice road here is not an actual road. It is just a trail made by tires. Sometimes, it is blocked by a car packed in snowdrift. Other people « crossing » stop and push, while wheels absolutely do not adhere on ice and snow. Sometimes they use a rope to pull the car in difficulties with another one. It happened to us too. I do not know how it is, with such a situation, if you are alone at the beginning of the night. Might be very hard. Valera dropped me at the first building of Listvianka. I did not understand where he went after that. Was he instructed by Annie, Nina or Anna Nikolaevna? Did he do this trip just for me? He even did not agree to get any money from me, the regular procedure in Russia. Who wrote Koty just deserves two hours? Who said it is not possible to drive on Baikal between Koty and Listvianka? Who told me Siberian people are not interesting people? On March 10 morning, I took a local marshrutka until the bus station to show Jürgen how to go to Listvianka. I walked in the town and made some pictures. Then, I met with Taya in Snejinka café. I “talked” with her thanks to Carole, Fleur, Gwen and Gaetan, my French students interpretors. Igor, Nastya and Sasha joined us. We had a tea at Taya’s. A big apartment very well located, downtown. Then Igor and Nastya drop me in Ekaterina’s district, a bit outside the city. I had diner in her family. Masha joined us. She lives in the same building, two floors below. Ekaterina and Masha were my bodyguards in the marshrutka bringing me back to Baikaler Hostel. I froze a piece of one foot finger, smoking with open slippers, by -20°C, as we were talking jokes with Carole, Fleur, Gwen and Gaetan in Baikaler backyard. On March 11, at 6:00 AM, a cab took me to Irkutsk airport.